Today, we're proud to announce new resources for students and teachers at Cemetech, and a new way for all of our visitors to find the resources relevant to them. Our Resources section (previously the Tools page) has been revamped with curated sections for Teachers, Students, and Programmers. 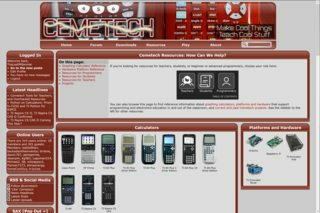 One motivator behind this overhaul was making it easier to find the sections of the site that even many long-time visitors might not have stumbled across, like SourceCoder, jsTIfied, the Learn @ Cemetech wiki, and our calculator reference pages. The second big motivation was the new Educational Projects and Lesson Plans section of our Archives. As we've been reminded by the last two years of TI's T^3 International Conference, the company and the teachers that use its tech have gone beyond embracing programming to embracing electronics and robots, via the TI-Innovator Hub and the TI-Innovator Rover. We've also seen teachers working with VEX Robots, Raspberry Pi-connected hardware, and even the Arduino (the inspiration behind ArTICL). We noticed a big gap: there's no good online community for teachers and students to collaborate on interesting projects with electronics, hardware, and calculators together, from TI, HP, and Casio or elsewhere. Therefore, we've added this new section to the Archives, and have shifted several sections of our Forum accordingly, as an experiment to see if we can provide that community. July 2004: A real forum, where members could converse, ask questions, and share projects, replacing a rudimentary message board. April 2005: File Archives, where Cemetechians could upload programs that they created and the public could download them. November 2005: SourceCoder, Cemetech's online TI-BASIC editor and IDE, was first released. 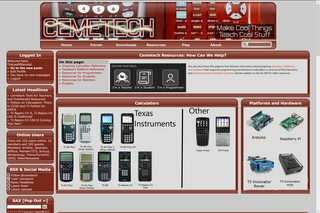 June 2006: Cemetech starts its first programming contest, one of 21 that have been held to date. October 2006: An official IRC channel, #cemetech on EfNet, was launched, linked to our in-page SAX chat system (itself introduced in May 2006. October 2010: A weekly video conference called Have Calc, Will Program (HCWP) was first held, initially with a set weekly agenda, and later evolving to an informal programming and collaboration session. January 2012: Development started on our jsTIfied in-browser calculator emulator. March 2012: The first of three books by Christopher Mitchell, "Programming the TI-83 Plus/TI-84 Plus, began, and was published in September. August 2012: Cemetech's first annual Back-to-School Calculator Buying Guide released. September 2012: Cemetech has a substantial presence at its first big event, World Maker Faire 2012 in New York City. March 2013: Cemetech begins its yearly tradition of sending founder Christopher Mitchell, often with other Cemetechians, to Texas Instruments' annual T^3 Conference. June 2014: The monthly Cemetech Projects of the Month (PotM) feature is first published. This step is the latest effort to expose our tools, resources, and community to the larger community of teachers and students. Please help me welcome any newcomers into the fold! Looking pretty spiffy. I particularly like the speech bubble "bullet points". Cool, I'm looking forward to the Arduino and Raspberry Pi sections! Other than this, I think this is definitely an improvement! Thanks! I might actually solicit Cemetechians' contributions to those and to the TI-Nspire sections. Sorry to be the Grammar cops, but on the Back to School guide 2017, allow should be "allows"
If you're a programmer, or you want to encourage your student to be a programmer, the TI-84 Plus CE is the best option. It allow BASIC, ez80 ASM, and C programming. The HP Prime also has a very fast BASIC language, and the Casio Prizm (fx-CG20 and fx-CG50) was the original C-programmable calculator. Other that that, I really like the new setup! You guys are eagle-eyed. Fixed both the news article and the topic. Thank you! We'll see how teachers respond. 2.1. Rename the "Teachers/Students/Programmers" to "I'm a Teacher/I'm a Student/I'm a Programmer"
3. Left align the black box, it looks strange and inconvenient to me just sitting in the middle like that. 5. The platforms and hardware section looks a bit strange since it's slightly shorter than the other sections, perhaps make it taller and make the images larger (so there's 2 pictures per row) to compensate and to match the size of the calculator pictures. 6.1. Move the TI 84 Plus SE between the TI 84 Plus and TI 84 Plus CSE, it doesn't make sense why it'd be next to the CE. In the interest of a semblance of democracy, any opinions on new vs. old there? I'll withhold my opinion until I hear some others. 1-Remake the "Choose Your Role" selection in a Cemetech Red™ color scheme, as the black looks out of place. 2-Remove the text that says "Table of Contents" directly below it. 3-Maybe make the calculator pictures more hi-rise, but that's me just being picky. I quite like the red; could you please show it in context of the surrounding page? I'm concerned that that might be an overwhelming amount of red. Everyone else: did you have any opinions on TheLastMillennial's proposed layout changes? I like how it doesn't blend in, since you want folks to see it and not ignore it. We use a thick red/maroon header to denote a new section and I feel like using red or maroon would not look great visually. I think the way it is now seems less cluttered and easier to handle the first time you see it, personally. If you only take one of my ideas, please move the 84 Plus SE between the 84 Plus and the 84 Plus CSE. It doesn't make any sense to have it in front of the 84 Plus CE. The only other tweak I'd really like to see is moving the black box to the left some, it makes it closer to the 'resources' tab which makes it faster to get to when you use the resources tab a lot. Looking back on it, I think we should actually reorganize the calculator list to have the 83/84 family on top row and have the 89/Nspire/others on the second row. Although that'd leave a lot of grey space with nothing in it. Perhaps the spacing could be tweaked to accommodate for it? There are 277 users online: 9 members and 268 guests.